NOTE Disk space and number of drives depends on the amount of content and the method chosen to distribute data for a SharePoint environment. The required version of .NET Framework is different for Windows Server 2012 R2 and Windows Server Technical Preview “Threshold”. Windows Server Technical Preview “Threshold”: SharePoint 16 requires .NET Framework 4.6 Preview, which comes with Windows Server Technical Preview “Threshold”. NOTE Beginning January 13, 2016, .NET Framework 4.5.2 will be the minimum version of .NET Framework 4.x supported by Microsoft. See the Microsoft .NET Framework Support Lifecycle Policy FAQ at http://support.microsoft.com/gp/Framework_FAQ for more information. All the required prerequisites are installed by the SharePoint Prerequisite installer. Application Server Role, Web Server (IIS) Role. 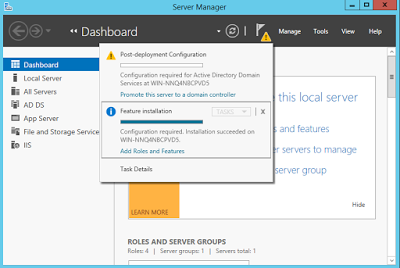 You can enable the Web Server (IIS) role and the Application Server role in Server Manager. However if the server is not connected to the Internet, the http://support.microsoft.com/en-us/kb/2765260 article has an Offline method that explains how to use several Window PowerShell cmdlets to add and enable these roles. Tool and components for Microsoft® SQL Server® 2012. Add-on providers for Microsoft® SQL Server® 2012. Microsoft ODBC Driver 11 for SQL Server is a single dynamic-link library (DLL) containing run-time support for applications using native-code APIs to connect to Microsoft SQL Server 2005, 2008, 2008 R2, SQL Server 2012, SQL Server 2014 and Windows Azure SQL Database. This redistributable installer for Microsoft ODBC Driver 11 for SQL Server installs the client components needed during run time to take advantage of new SQL Server 2012 features, and optionally installs the header files needed to develop an application that uses the ODBC API. Microsoft Sync Framework is a comprehensive synchronization platform that enables collaboration and offline scenarios for applications, services, and devices. Developers can build synchronization ecosystems that integrate any application and any type of data, using any protocol over any network. This service pack is intended to fix a handful of bugs as well as to transition to a public-facing change tracking API that is new in SQL Compact 3.5 SP2. AppFabric is a set of integrated technologies that make it easier to build, scale, and manage Web and composite applications that run on IIS. AppFabric targets applications built using ASP.NET, Windows Communication Foundation (WCF), and Windows Workflow Foundation (WF). Cumulative update package 1 for Microsoft AppFabric 1.1 for Windows Server. This hotfix package resolves several issues and adds several features that are described at https://support.microsoft.com/en-us/kb/2671763. Microsoft Federation Extensions for SharePoint 3.0 enables interoperable federated access to SharePoint 3.0 sites using the WS-Federation standard. It is built using the Windows Identity Foundation and supports use of ADFS 2.0 as an identity provider. The Active Directory Rights Management Services (AD RMS) Client 2.x is software designed for your computers to help protect access to and usage of information flowing through applications that use AD RMS. WCF Data Services 5.0 enables creation and consumption of data services for the Web according to version 3 of the Open Data Protocol (OData), which facilitates data access and change via standard HTTP verbs. WCF Data Services 5.0 includes .NET Framework server and client libraries as well as Silverlight client libraries. This installer will update the NuGet packages referenced by the WCF Data Services item templates to version 5.6.3. This installer also makes the code generation (the “Add Service Reference”) for consuming OData V3 endpoints available for all current and future .Net 4.5.X versions. The Microsoft .NET Framework 4.5.2 is a highly compatible, in-place update to the .NET Framework 4.5.1, the .NET Framework 4.5, and the .NET Framework 4. However, it can run side by side with the .NET Framework 3.5 Service Pack 1 (SP1) and earlier versions of the .NET Framework. The .NET Framework 4.5.2 for Windows 8.1, Windows RT 8.1, and Windows Server 2012 R2 is available on Windows Update and on Windows Server Update Service (WSUS). Resolved a security issue that has been identified that could allow an unauthenticated remote attacker to compromise a system and gain access to information. The Visual C++ Redistributable Packages install run-time components that are required to run applications that are developed by using Visual Studio 2013, on computers that don’t have Visual Studio 2013 installed. These packages install run-time components of these libraries: C Runtime (CRT), Standard C++, ATL, MFC, C++ AMP, and OpenMP. SharePoint Server 2016 requires SQL Server 2014 for its databases. You can download SQL Server from the TechNet Evaluation Center at http://www.microsoft.com/en-us/evalcenter/evaluate-sql-server-2014. In addition SharePoint Server 2016 will support SQL Server 2016. For additional information on SQL Server 2016 see also http://www.microsoft.com/en-us/server-cloud/products/sql-server-2016/. One of the early new infrastructure advancements in SharePoint Server 2016 is a new concept, MinRole. MinRole is designed to transform guidance into code, simplifying deployment and scale with SharePoint ensuring a request is served end-to-end by the receiving server based on the origination of the request (I.e. end user or batch processing) and role of the destination server. 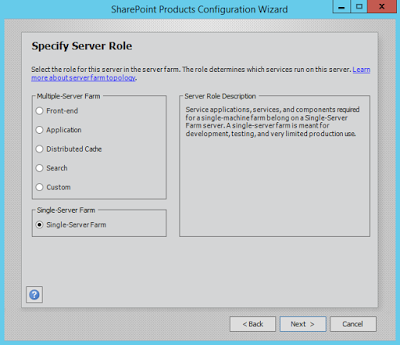 In previous versions of SharePoint, installation is role agnostic, which being a SharePoint servers’ role was only defined by what services were provisioned and its placement in a SharePoint Farm topology. In many cases to serve a request, whether end user initiated or otherwise, the request traversed the scope of the SharePoint topology. In addition, for each role there were specific documented recommendations to address performance and capacity planning, see also Streamlined Topologies for SharePoint Server 2013. In SharePoint Server 2016 documentation was put into code based on the experience of running SharePoint at scale in Office 365. MinRole provides an out-of-the-box experience that provides topology recommendations, simplifies on-premises server farm deployments, and reduces the unit of scale to simplify capacity planning while providing predictable performance characteristics through enabling selective provisioning of SharePoint server roles based on position and function within a topology. Special Load Reserved for services to be isolated from other services, I.e. 3rd party, PerformancePoint, etc. Web Front End Services end user requests, optimized for low latency. Single Server Farm Provisions all services on the server for a single server deployment. This role is provided for evaluation and development purposes. Search Reserved for Search services. Application Services the backend jobs or the requests triggered by backend jobs, optimized for high throughput. Distributed Cache Services distributed cache for the farm. Optionally, the server assigned to this role can load balance end user requests among the web front ends. A predefined server role is configured and optimized for its intended purpose provisioning the expected services designed to support its function within a server farm environment. In SharePoint Server 2016 MinRole can be instrumented through the PSConfig GUI or command line. MinRole provisioning is available through PSConfigUI.exe in addition to PSConfig.exe. To ensure role-based servers remain in compliance with their specified configuration – SharePoint Server 2016 includes new SharePoint Health Analyzer Health Rules to evaluate individual server role compliance and notify administrators of any changes to a predefined server role. For example, if a server role is provisioned as a Web Front End and an unexpected service (I.e. Search) is provisioned on that machine, the SharePoint Health Analyzer will detect the deviation and generate a warning indicating the server is out of compliance in addition to providing an option to programmatically resolve the issue and bring the server back within compliance with its configured role definition. NOTE The Special Load role is exempt from scanning. Administrators can change the scan schedule and/or disable the scan entirely in addition to disabling the auto-fix capabilities designed to ensure a server remains within compliance with its assigned role. In the event automatic fix is disabled, MinRole will not enforce compliance with the servers’ assigned role. In addition MinRole provides support for automatic provisioning of services assigned to a servers’ respective role. In conclusion, MinRole improves performance and reliability through ensuring an incoming request is served by the receiving server, reducing server to server interaction, reducing dependencies, and improving speed – enabling a model based on unit scale that provides better load distribution and proper sizing when compared to SharePoint Server 2013. 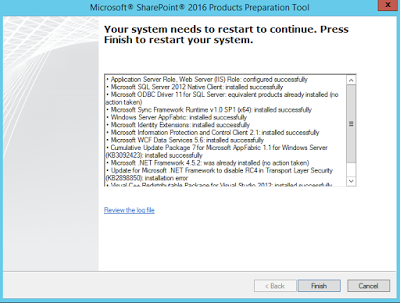 NOTE SharePoint Server 2016 does not support standalone installation which automatically installed SQL Server Express Edition and configured the farm on a single computer. 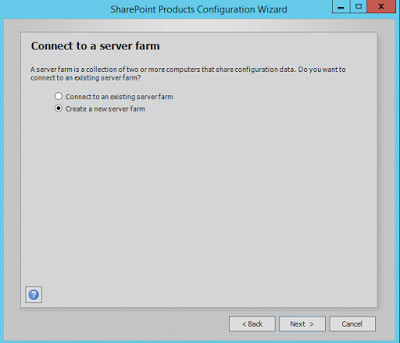 You can deploy SQL Server and then configure the SharePoint farm separately using SharePoint Farm Configuration Wizard in Central Administration. SharePoint Server 2016 will support upgrade from SharePoint Server 2013. To upgrade from SharePoint Server 2013 to SharePoint Server 2016, you can use the database-attach method to upgrade. 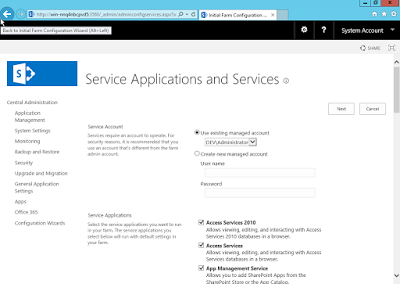 In the database-attach method, you first create and configure a SharePoint Server 2016 farm. Then you copy the content and service application databases from the SharePoint Server 2013 farm, and then attach and upgrade the databases. This upgrades the data to the new version. NOTE Site collections provisioned in backward compatible SharePoint 2010 (14) mode, must be upgraded to 2013 prior to upgrading to SharePoint Server 2016. For additional information on upgrading site collections to SharePoint 2013 see also https://technet.microsoft.com/en-us/library/jj219650.aspx. This guide shows you how to create a closed environment with an Active Directory on a separate server. With a closed environment depend on connectivity to your company’s AD or on a person managing it (e.g. if you need accounts or changes). The final product will be announced with RTM (Released to Manufacture) Version. Mode for testing and Developmental Purposes. *There is a built in SQL Server. You need to install a separate SQL Express/Developer or any other edition even for development server. Windows Server AppFabric v1.1 (MS is planning tend AppFabric, but it will be supported for SP 2013 and 2016). Allowing to use STARTTLS connection encryption. Search – service application provisioning, indexing service and other search components. Distributed Cache – servers distributed cache for the farm. Single Server Farm – for development purpose, configure (excluding SQL Server) all services on one server. Search scaling up t500 M items. Create faster site collections at database level using the standard site template saved as site. Bi-directional sync using external FIM service. Nbuilt in FIM anymore. Still require separate Project Server Licensing, but SharePoint and Project Server content database is merged. New sharing URLs are resources Id based, thus renaming file, moving file will not break the link already shared. This showcase the feasibility of bringing same compliance system ton-premises which works well in O365 with Azure RMS. Discover and preserve with hybrid eDiscovery. This unifies the on-premises and cloud data search from one search center. This also adds value to Office Graph / Delve textend the presence on on-premises. This can alsleave search running in cloud only while indexing from on-premises and online. Making easier to maintain and publish sites to Internet. Using O365 Identity federation services. Follow sites, documents or people in on-premises and master the information in cloud. Note: the information in this blog post is based on the information presented and available on public forums. 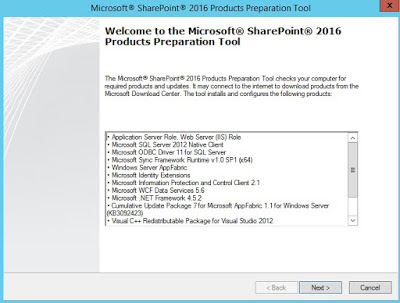 The actual product SharePoint 2016 can have difference from what is available. Please take time to check the new features when the product is released. A Three-Tier farm is used for this scenario together with a Separate Active Directory Server in order to demonstrate the three layers as below figure. 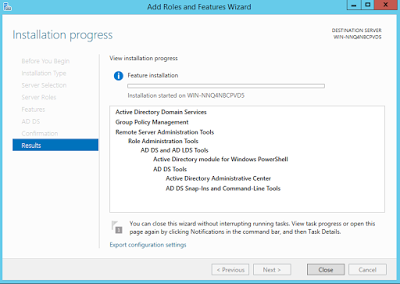 Start the install wizard for Windows Server 2012 R2. Install an operating system which includes the GUI. Select ‘Custom: Install Windows only (advanced)’ and create a new partition using the drive options. Use the newly created partition to install Windows Server 2012 R2. Note: At this point you have a basic but not configured Windows Server 2012 R2 image. Open Control Panel > Programs and Features > Turn Windows Features On and Off > Add Roles and Features > Click ‘Next’ from the Prompt Window and opt for ‘Role based and Feature Based Installation. Select the Local Server from next Window and click ‘Next’. 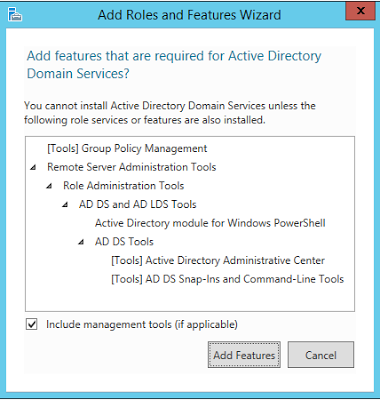 Select ‘Active Directory Domain Services’ from next window. Setup will prompt for dependent features that are required for Active Directory Domain Services installation. Click on ‘Add Features’. After Clicking ‘Add Features’ from the previous window, installation will begin. Click ‘Close’ once the installation is completed. 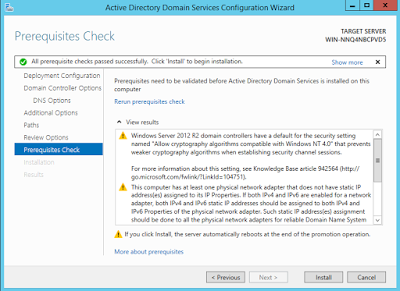 Now that the Active Directory domain services are installed, we need to promote the server as Domain Controller and create a Domain. Click on the warning sign appearing on the main Server Manager Window. A popup will appear. From the popup, click on ‘Promote this server to a domain controller’ link. 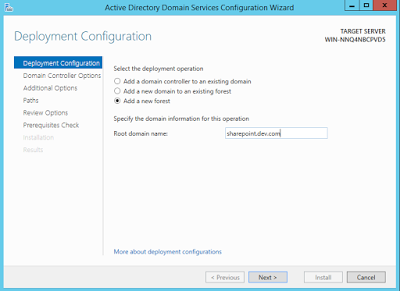 Active Directory Domain Services Configuration Wizard will start. Select ‘Add a new forest’ option, give your root domain a domain name and click next. On the next window, provide the password for ‘Directory Services Restore Mode’ and click next. Click on the Install button and wait for the installation to complete. You need to restart the server once domain controller is setup. After restart, you will see your domain name prefix with your local admin account. (Demo server\Administrator). Login to the DEMO SERVER servers and Join a domain and if necessary. Restart your Servers. Login to the all servers and Go to ‘Control Panel > Network and Internet > Network and Sharing Center’ and select ‘Change advanced sharing settings’. On the Change Sharing options for different Network Profiles, Enable ‘File and printer sharing’. This allows you to ping your servers and helps you to trouble shoot problems e.g. checking connectivity. Login to the all server and Enable virtual memory using ‘Control Panel > System and Security > System’. Login to all server and Enable remote desktop using ‘Control Panel > System and Security > System’. Login to all server and Turn off Windows Firewall for domain networks from the firewall setting page under control panel. Open mount SQL server 2014 SP1 ISO file and right click on Setup run as Administrator. The landing page looks pretty similar to the earlier versions, and you can choose the installation tab to get things started. Choose the stand-alone install option, and it will take you to the product key page. This screen is where you need to accept the license terms. These are the steps where Global Rules, Product Updates are checked and Setup files are extracted and installed. If the checks are good, then the install will proceed to the next step automatically. Install rules are checked for this step. This step provides you with Feature installation options. In this install I will discuss about the first option, ie SQLServer Feature Installation. This step lets you decide if you want to go with Default Instance or a Named Instance. We select the account for the services. Select the Authentication mode, Data directories, and File Stream options as mixed mode, For Data Engine configuration and File stream let it be by default only and do next. On the analysis service configuration wizard select default multidimensional and data mining mode and add current user and do next. On Reporting services configuration select install only, Later we can configure. Go the directory where do you have your installation files. Then click on Install software prerequisites to start Prerequisite tools installer or you can find out the Prerequisite.exe file and run as run as Administrator. It will start product preparation tool do next and install this, Once this will finish server will get restart. Click Install to start installation progress. Once installation will finish don’t run the SharePoint 2016 Products and Configuration Wizard, Close wizard and run configuration wizard. Click Next to preview configuration summary. Then, click next. The Configuration process will be progress. Once installation will finish, Automatic Central admin site will get open as below. Cancel Start wizard and click on central administrator. From the following URL, you obtain the RC of the patch. More than one patch is available for download, but, what is needed is “SharePoint Server 2016 Release Candidate Global Patch.zip”. 2.3 It will download in zip format, unzip and install prerequisite installer, once it will install, server will get restart and finish installation. 2.4 Application of Patch Each Patch because that is the zip, leave expand it. First, expand the SharePoint Server 2016 Release Candidate Global Patch, run the sts.msi. 2.5 By the way, the message to close the AppFabric cache service as shown in the following figure came out in the hand of the verification environment. Here there is no problem to go with [OK]. 2.7 After installation of the patch, to access the SharePoint Central Administration site, click Upgrade and Migration> management of the state of the update, and then verify that each patch has been applied. 2.9 In addition, the SharePoint Central Administration site, make sure that it is the [System Settings]> to access the [this server management of the farm], version of the configuration database is “16.0.4327.1000”. By the way, in Beta 2 this version was “16.0.4306.1001”. 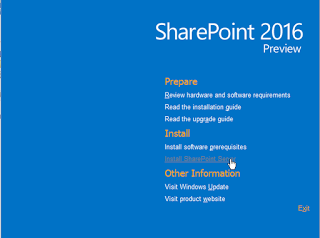 Below is the summary of SharePoint 2016 installation process. 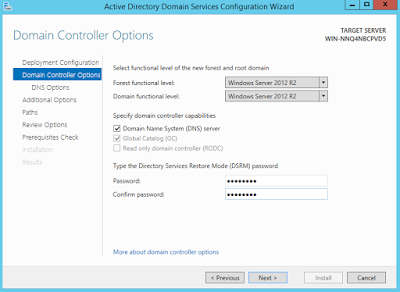 Add ‘Active Directory Domain Services’ Role to the server and promote the server as Domain Controller. Install SQL Server 2012 SP1. 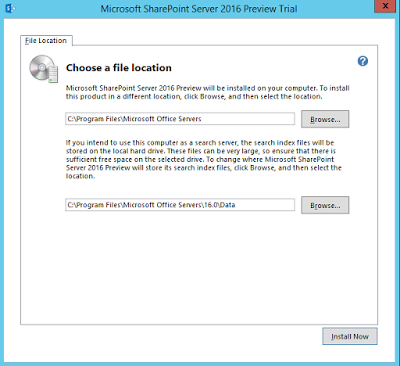 Install SharePoint 2016 Prerequisites on the server. 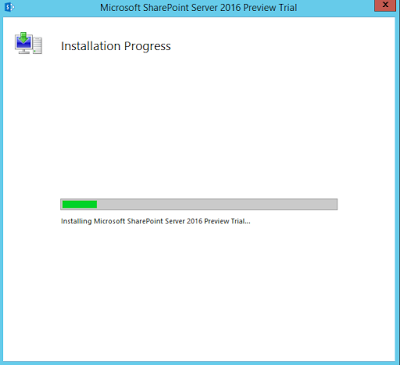 Install SharePoint 2016 Beta 2 on the server. 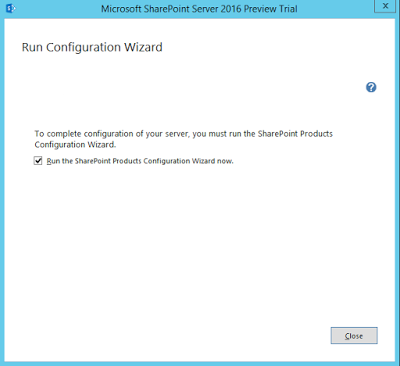 Run the SharePoint 2016 Products Configuration Wizard. You need to restart the server once domain controller is setup. After restart, you will see your domain name prefix with your local admin account. (DEV\Administrator). I assume you already know how to install SQL Server 2012. Run the SQL Server 2012 Wizard and install the server. Refer to this article if you need any help. Also note that since we are setting up only virtual environment for development purpose, creating separate service accounts for different SharePoint and SQL services is beyond the scope of the article. We will only use default Local Administrator account. (Note that you need to have internet access on your VM to download prerequisites software). 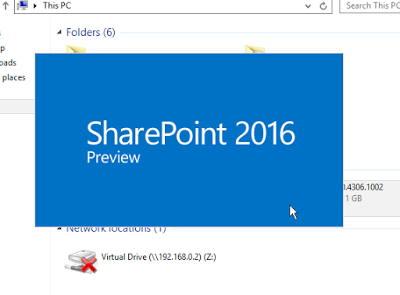 Mount the SharePoint 2016 ISO file to the VM. Double click on the drive to start the SharePoint 2016 setup (Alternately, you can open the drive and run default.exe or setup.exe). 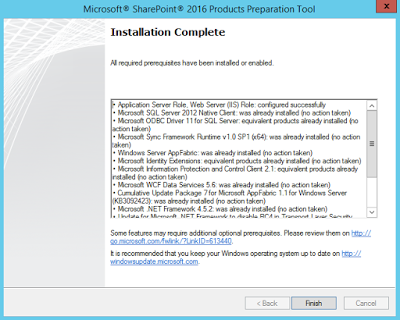 SharePoint 2016 installation wizard will start. 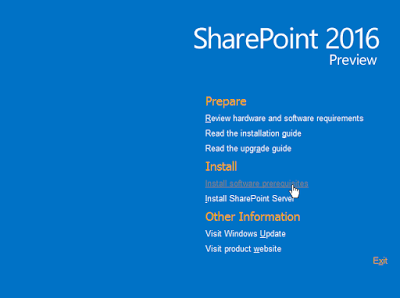 From the SharePoint 2016 setup wizard, under ‘Install’, click on ‘Install the software prerequisites’. Click Next from the welcome window. Once the Application Server and Web Server Roles are configured, setup will prompt to restart the Server. Restart your VM. After restart, setup will continue installation. Once the installation is successfully completed, click Finish button. Here is the main part. Run the SharePoint 2016 installation media and click on ‘Install SharePoint Server’ link from the installation dialog. 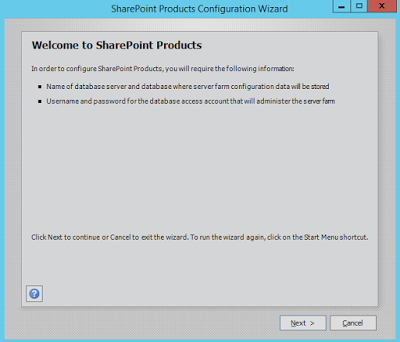 SharePoint 2016 setup Wizard will start. 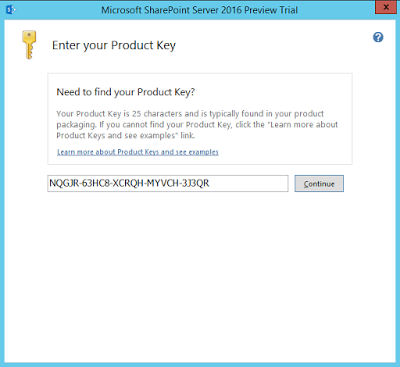 Enter the SharePoint 2016 Trial Beta 2 Version Product Key NQGJR-63HC8-XCRQH-MYVCH-3J3QR and click continue.If this trial key does not work, please refer to the ‘Install Instructions’ section of Microsoft SharePoint 2016 Beta 2 trail version download page to get the latest key. 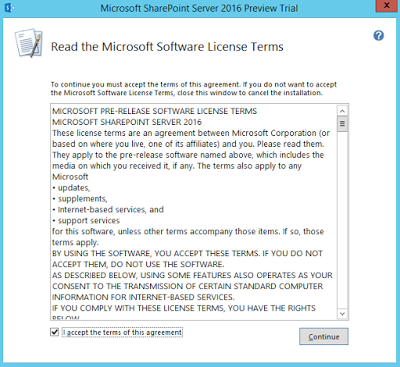 Accept the Microsoft Software License Term and click Continue. From next window, if you want to change default installation path, click Browse and provide location otherwise leave default installation path and click ‘Install Now’. 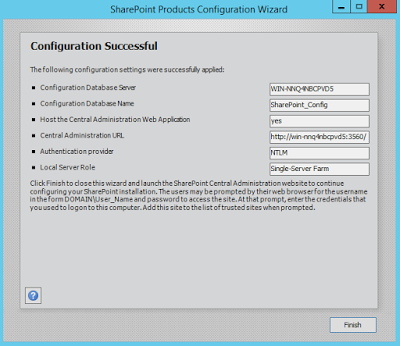 Once the SharePoint 2016 Installation is finished, setup will auto select ‘Run the SharePoint Products Configuration Wizard now’ option. Leave this option selected and click ‘Close’. 5. 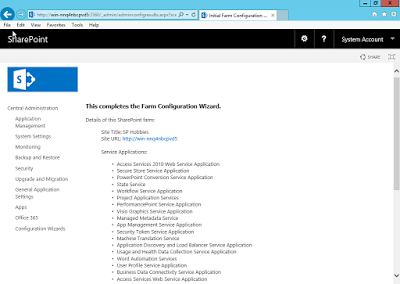 Run the SharePoint 2016 Product and Configuration Wizard. From the SharePoint Products Welcome window, click Next. Select ‘Create a new server farm’ option and click Next. Provide the database server name. If database is installed on the same VM, you can just enter dot which means local server. 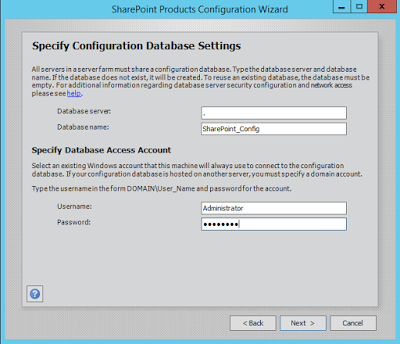 You can also enter local or remove database server name.Leave the Database name as SharePoint_Config. This will be the SharePoint central admin configuration database. Provide the Username and Password to connect to the database and click Next. 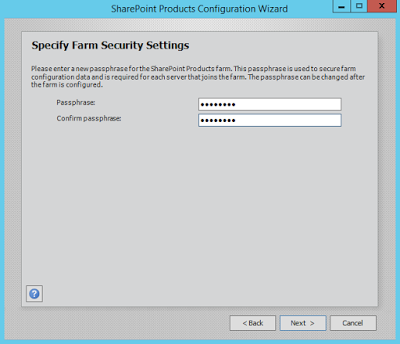 Enter the SharePoint Farm Passphrase and click Next. This Passphrase is required to connect with the Farm while adding a new server. Select the Role of the Server. Since we are setting up Single Server Farm, select ‘Single-Server Farm’ from this option and click Next. 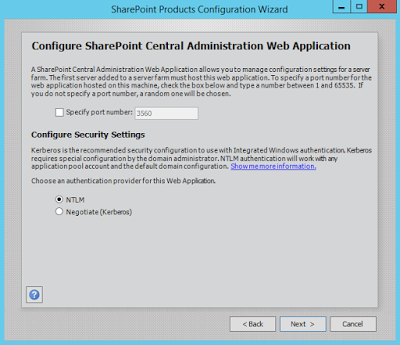 From Next window, specify SharePoint Central Administration Web App port number and click Next. I suggest you to keep the default port. 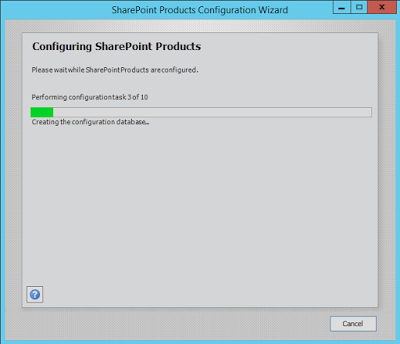 SharePoint Product configuration will start. Once configuration is completed, copy the central administration URL and click Finished. 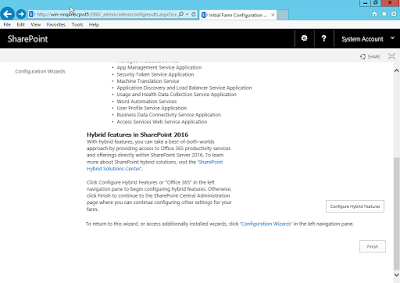 Open a new browser and hit SharePoint 2016 Central Administration URL.SharePoint Farm configuration will start. Click on ‘Start the Wizard’ button. From the Service Application and Services screen, leave the default option selected and click Next. 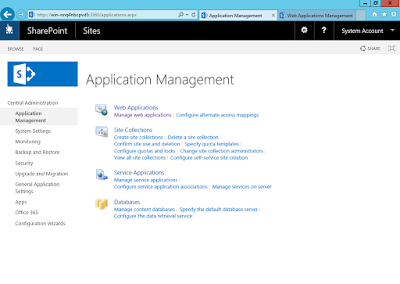 SharePoint will configure the SharePoint Farm Level Applications and Services. Once Farm Level Application and Service are successfully provisioned, you will receive the Farm Configuration completion message on the screen. Scroll down and click on Finish. 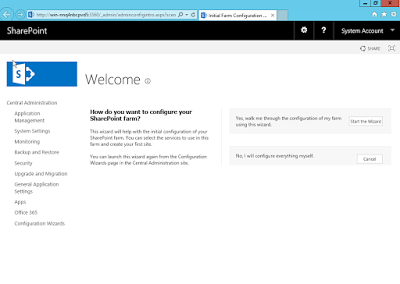 Now you can go to central admin and create your first SharePoint 2016 web application. 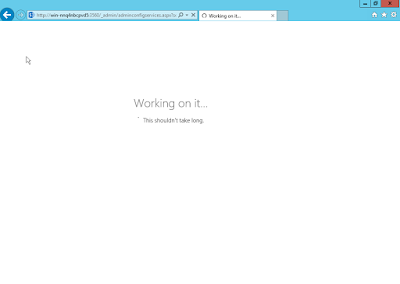 Congratulations, you have successfully installed and configured SharePoint 2016 ! !